I’ve attached a photo of the packaging and the status of the contents. I’ve emailed the photos to the company, asking if they consider this to be acceptable quality, and am waiting for a reply. Matt. I really enjoy following your blog, its fun to read about expat’s experiences. To me it looks like someone might have opened the packet and resealed it. However bad these people ship I really can’t see them wrapping and shipping a box in that state!!! Hi Jose, thanks for the comment. It’s nice to hear from you! 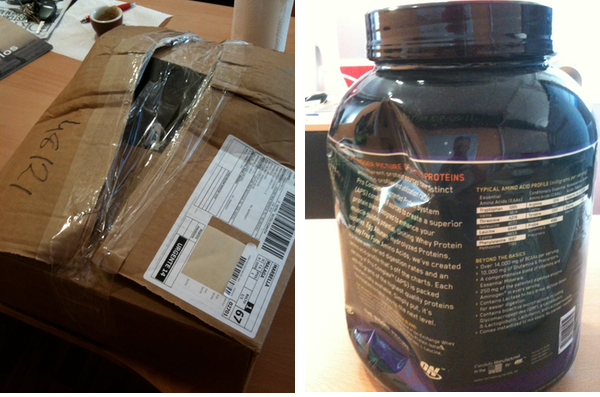 Actually, what seems to have happened is that MASMusculo sent the Optimum Nutrition products in a box from another product (Animal Supplements), as that was the name printed on the side. And that Animal Supplements box was waaaay to small for the ON product. Anyway, I have to say I’m not that dissatisfied with MASMusculo, all things considered. At least they are very fast; I usually get my order within 24 hours.